Yes, I love ice cream. With a passion. No matter if Summer or Winter, I could eat ice cream every day. The photos below are all from last Summer. I basically ate three things all Summer: ice cream, fruit and a plate full of thai food every now and then. A new ice cream place opened in Graz and it's so so good. And organic. And SO GOOD. But I gave up sugar in the fall, and while I am fine not being able to eat chocolate, cookies or cake (who would have thought? ), I really really miss ice cream. So I thought I'd give those popsicle molds a try. First I looked on Pinterest for recipes, of course, but then I decided to just play around with fruit, yoghurt and anything that might taste good frozen. On the left side: vanilla soy yoghurt and raspberry. I just poured it all into the mold, alternating spoonfulls of yoghurt and bits of frozen raspberries. Yoghurt creates a creamsicle kind of texture and of course you could use regular yoghurt or greek yoghurt. There's this one vegan yoghurt brand that I really like, so I always have that at home, usually the unsweetened, plain kind but for this I figured, even if there's a bit of sugar in there it's much less than in regular creamsicles. On the right: cantaloupe with pineapple. I bought both fruits, purreed them and mixed them up in a 2 parts cantaloupe 1 part pineapple ratio - that's also a good thing about making icecream by yourself, you get to make them from your favorite fruits! On the left side: raspberry with just a tiny bit of plain soy yoghurt - it was good but next time I'd use a bit more yoghurt to create more of a creamsicle. On the right: cantaloupe with a sip of tropical juice. That was really yummy, very refreshing and the juice separated a bit from the cantaloupe when it froze, so the top tasted a bit more like the juice and the bottom more like the cantaloupe, that was nice! On the left side: the second most surprising result. I saw this red smoothie at the grocery store, purchased it out of curiosity and realized after the first sip that it had beetroot in there. Gotta love beetroot! That was also a simple one - I just poured it directly from the bottle into the mold, no mixing, no purreeing of any kind. In the middle: That one was pretty interesting, too. I tried out three different kinds of unsweetened chocolate something, first soy milk (yuk! ), then rice milk (mmmhhokay) and then another kind of rice milk (big yay), and that last one turned out to be really good. I just wanted some kind of chocolate-y popsicle or creamsicle, too. Last night I tried another combination of this chocolate rice milk, a shot of espresso and a tiny bit of greek yoghurt, and it also turned out pretty amazing! No photo, though, cause that is how good it was. On the right: the most surprising result yet! I made a batch of my favorite green juice and decided on a whim that I'd give it a try. It turned out SUPER YUMMY. It looks weird, ok, but the taste? Amazing! Also, they make for beautiful photo props. Another couple of things I will try: anything coconut, watermelon, mint (I just purchased moroccan mint... mmmhh), more variations of chocolate, and definitely strawberry once they are in season over here! 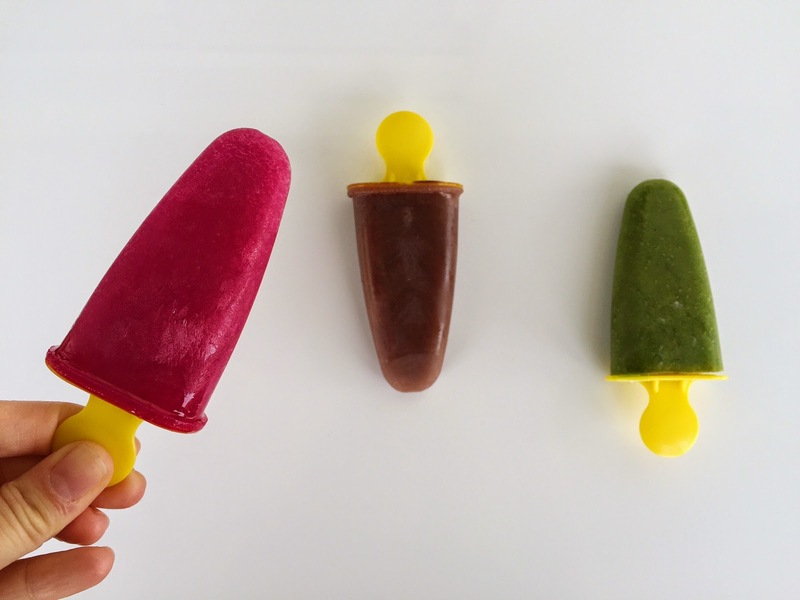 The good thing about these molds is that sometimes I make as many as six different popsicles. I just prepare small amounts of everything, and if one of the mixtures turns out yucky it wa just one popsicle. Have you ever tried that? Which combinations did you like the most?